These Are The Pool & Shack Hours For The Entire Season! Please Review Article 7 of the Member Handbook for Swimming Pool Rules & Regulations. 7.0 POOL MEMBERSHIP AND USE: The pool and pool areas are available for use only by members and their guests subject to the following rules, which are for the health, safety and maximum enjoyment of the facilities by all who use them. 7.1 HOURS: Pool hours are 10:00AM through 8:00PM every day from Memorial Day through Labor Day. 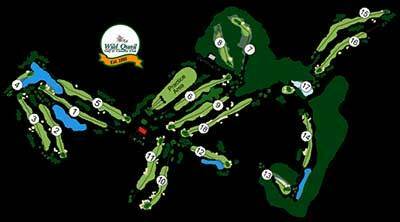 7.2 SNACK BAR HOURS: 11:00AM through 5:00PM daily. 7.3 CLOSURE: During periods of inclement weather the pool will be closed. Closures will last at least one half hour for thunder and at least one hour for lightening. 7.4 REGISTRATION: A registration sheet is maintained at the pool, and each member using the pool area must register themselves along with their children and guests upon entry to the pool area. Such registration must be made daily. 7.5 CHILDREN: Children less than ten years of age must be accompanied by an adult or guardian who is responsible for the child or children. Guards are not baby sitters and may not be used for that purpose. Children less than four years of age may use the large pool only with parental supervision in the pool. NO DIAPERS will be allowed in the pool. Children who are not able to swim will not be permitted in the pool at any time unless taking swimming lessons or unless accompanied by a parent or guardian. 7.6 GUEST FEES: Member is responsible for the fees of their guests. All guests’ names and residences must be registered regardless of place of residence. 7.7 CLUB POOL PARTIES: If any club groups or individuals want to use the pool in the evening for a private party, the request for that particular day and the hours MUST be presented to the Event Coordinator no later than fourteen days prior to the event. The guaranteed head count must be present at least 2 days before the function date. 7.8 LIFEGUARDS: The operation of the pool facilities shall be under the complete charge of the Head Lifeguard who shall be in control of the pool area. He/she is charged with the enforcement of these regulations. 7.9 DRESS AND TOWELS: No cut-offs allowed in pool. Proper pool attire required. Must provide own towel. 7.10 STATE HEALTH DEPARTMENT AND OTHER HEALTH AND SAFETY RULES: These provisions are incorporated and adopted in conformity with State of Delaware laws, separate and apart from compliance with other regulations herein, and infringement of these Health Department regulations are cause for suspension of pool privileges. All persons known or suspected of being afflicted with flamed eyes or skin disease, or wearing bandages shall be excluded from using the pool. Expectorating or blowing of the nose while in the pool is prohibited. 7.11 The following are additional health and safety rules pertaining in large measure to the operation of the pool and the conduct of persons using the pool areas. Swimming is permitted only when a lifeguard in on duty. No animals permitted in pool area. No hazardous material may be taken into the pool area. Use of toys and swimming accessories are discouraged unless prior approval is received from Head Lifeguard. Report ALL accidents to Lifeguard on Duty. Give immediate attention to Lifeguard on Duty at all times. 7.12 Food and beverage are available in the snack bar and shall be consumed in the designated area. No food or beverage shall be brought into the pool. No life preservers allowed in the pool. Water wings are only allowed if a parent is in the pool with the child. Diving in the diving area only. No Smoking within 10 feet of the pool area. No unauthorized person is permitted in the lifeguard’s office or in the filter room. No running, pushing, wrestling, climbing, or causing undue disturbances in or around the pool area. 7.14 We urge the cooperation of all parents in enforcing these rules for the safety and enjoyment of all. Please listen to the lifeguards. They are here to help PREVENT accidents. Every precaution will be taken for the health and safety and for the protection of personal belongings; but the club takes no responsibility for accident, injury or loss of any kind. All suggestions regarding the pool should be made in writing and turned in to the office. 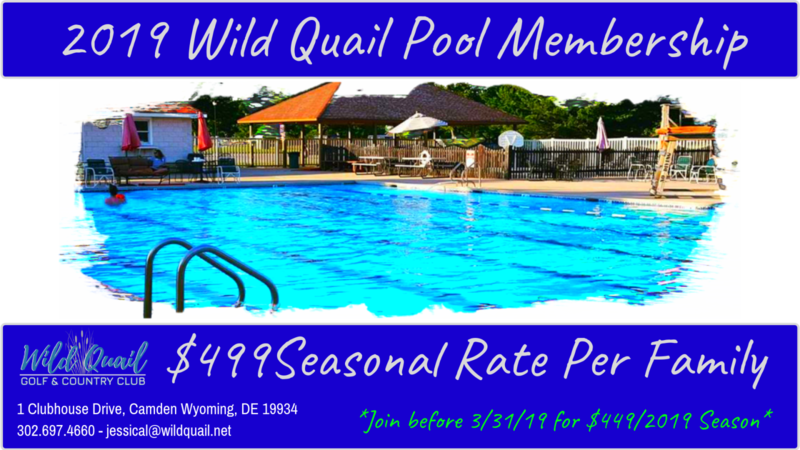 Club Wild Quail, LLC has the right to suspend the pool privileges of any person who does not comply with these regulations or with the instructions of the Lifeguard on Duty. *Person will be warned by Lifeguard. *“Benching” or “Time-out” will be used. *Phone call and letter to offender or family of offender. *Suspension from pool for designated time period.